Front Rotor Outside Diameter (in): 14.000 in. 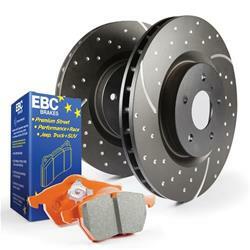 If your truck, Jeep, or SUV is pressing the limits, do yourself and your passengers a favor by replacing them with EBC Stage 8 kits with extra-duty brake pads and GD rotors. These kits are designed and built for one thing--extreme stopping power! The pads are constructed using a carbon granule based extra-duty material to deliver a smooth, powerful braking experience. EBC includes piston insert insulating shims that ensure that the brake pads will be felt and never heard; plus, these extra-duty pads will operate great at cold temperatures and won't fade at high temperatures. The Sport dimpled and slotted brake rotors (GD Series) are constructed from quality gray steel and are black GEOMET coated, creating a beautiful look, while also protecting the rotors from corrosion and rust. The GD Series rotors have machined spots to pull cool air into the rotors to reduce temperatures, and slots to remove unwanted dust and debris. Drilled dimples allow the brake pads to degas, and are better for the lifespan of the rotors. If you're looking for the best, congrats--you have found it with these EBC Stage 8 kits!